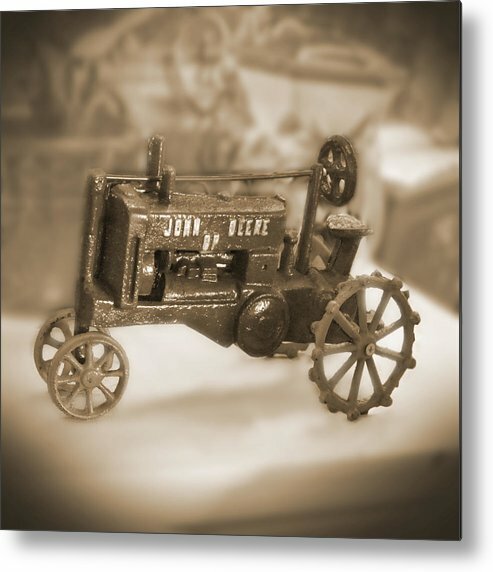 Cast Iron Toys by Mike McGlothlen - 8.000" x 8.000"
Cast Iron Toys metal print by Mike McGlothlen. Bring your artwork to life with the stylish lines and added depth of a metal print. Your image gets printed directly onto a sheet of 1/16" thick aluminum. The aluminum sheet is offset from the wall by a 3/4" thick wooden frame which is attached to the back. The high gloss of the aluminum sheet complements the rich colors of any image to produce stunning results. Thank you Margaret Palmer for featuring this image in your group North Carolina, means a lot! Wonderfully nostalgic, Mike! I had a few of those myself, growing up! I found a box of my Dad's Cast Iron Toys. Man those things were heavy and indestructible. I guess the only problem was that most of them were painted with lead paint. We live and learn. If you like this image, please help me by clicking the like button at the top right and consider adding it to your favorites, Thank You!